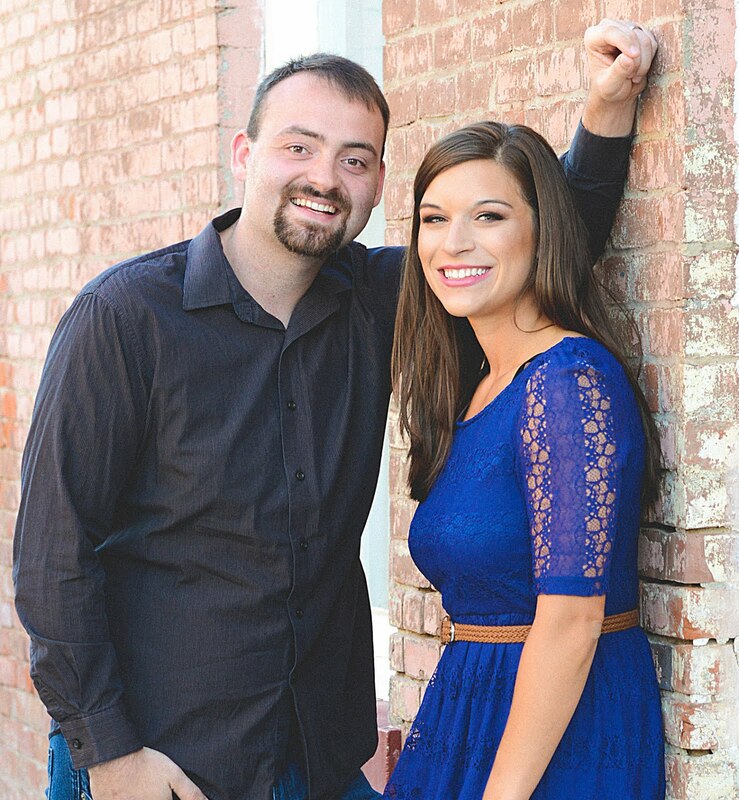 Aaron and I love to travel, but since we're both teachers, it's not something that we can afford to drop a ton of money on all the time. Our solution? We're members of some fabulous travel rewards programs, and we pay our bills with their credit cards. This way, we make our money work for us, and we still get to travel without feeling guilt or going off budget. One of our favorite rewards programs, and very favorite hotel company to stay with, is the InterContinental Hotels Group. A while back, I shared a post about the IHG Rewards Club Credit Card: how we use it, how you earn points, and how you redeem them. Today I'm here to show you how to search within point ranges to book your dream vacation. Although I won't be visiting anywhere in the Caribbean for a while because I'm pregnant, I'm already looking forward to doing some traveling with our little one this summer. Next on my travel bucket list? 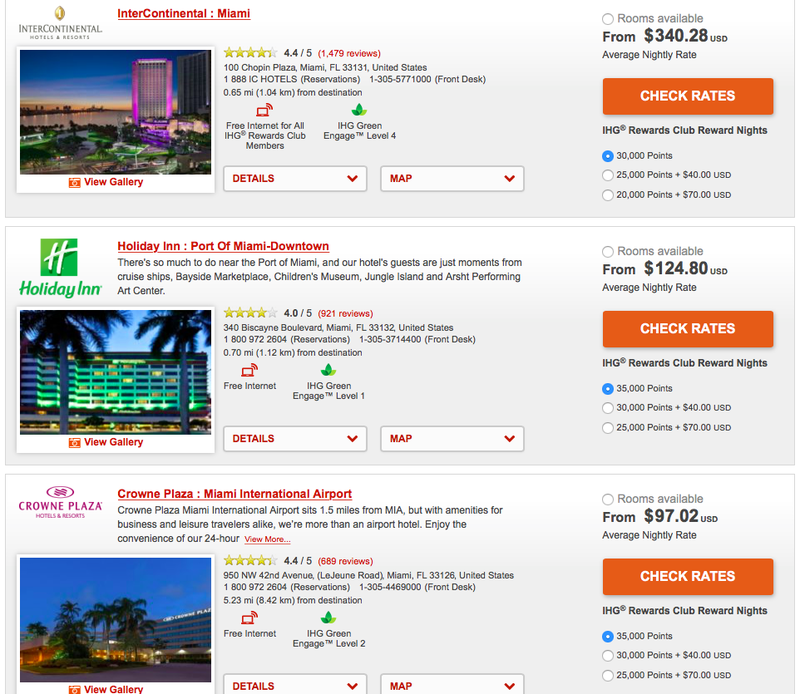 Book a trip to Miami and Key West! When I'm ready to search for a hotel to book with our reward points, I go to the Reward Nights Link, and then type "Miami, FL" into the destination box. You'll select your dates next (see photo above), and the choose a point range you're looking to stay within. If you know you only have a certain amount of points, you can search for that amount, or you can buy more points. 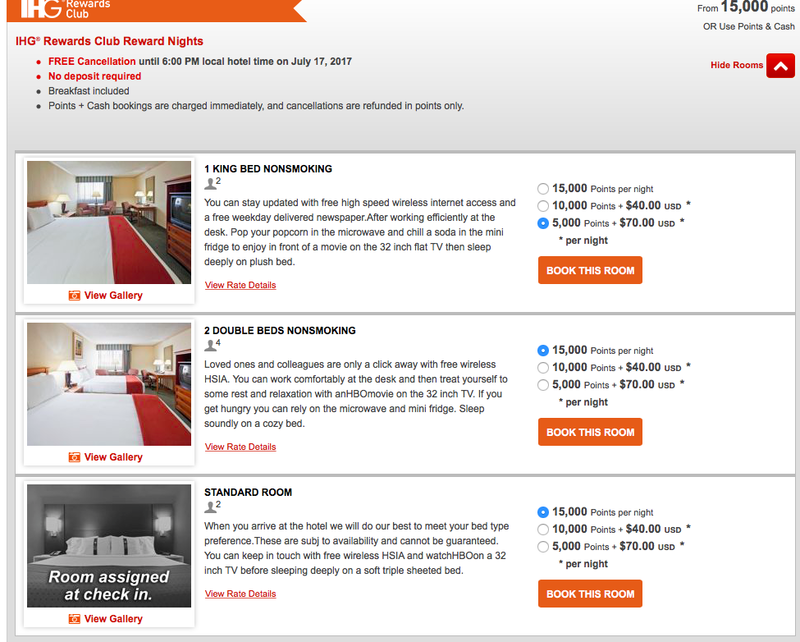 IHG is extra amazing because it lets you combine cash and points to find the perfect fit for your reservation purchase. Underneath the "check rates" box for each hotel, you'll see the point values, showing different increments and points as well as cash combo options. You can even sort your results by "rates" if you'd like, and then you'll probably get the best bang for your buck! 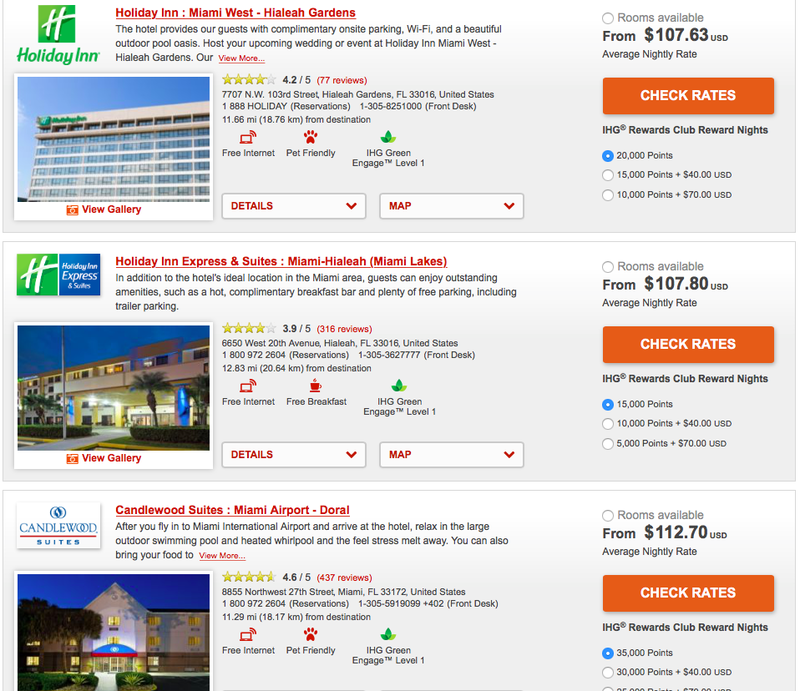 When you're ready, select the Miami hotel you want. You can even pick extra bonus packages, and breakfast is included most of the time! Another awesome thing about the InterContinental Hotels Group is that they let you cancel up until the evening of your reservation, and you'll get your points back (for free). The flexibility of the program is amazing, and we have always had incredible stays at clean, comfortable hotels. Even though we'll have baby in tow, we're excited to plan next year's vacation. With the help of great travel groups like IHG, traveling doesn't have to break the bank. Let me know if you have questions or need help. Maybe we will see you in Miami! I love IHG hotels! We almost always choose Holiday Inn Express if it's an option. We love the great rates, clean rooms, and big breakfast selection. Yes! We love them too! I love being able to book vacations in a way that doesn't cost a crazy amount of money! Thanks for sharing this rewards program! Agreed! If traveling was always pricey, we wouldn't do it! That's great! I use my Venture Rewards card for purchases so I can get good deals on flights, but I need an option for hotels too! There are other great rewards programs we use for other hotel chains, but IHG is our fave! How interesting! I am not familiar with this but love to travel so will definitely check this out! Thank you for sharing!! You should definitely check it out. Thanks for reading! I've never used this but it looks great! I really wish I could travel more. I love seeing new places. I'm thankful that the military took me alot of places I would have never gone. I'll have to keep this program in mind for my next trip. I love traveling! You should keep it in mind for sure! I have never used this site before. sounds really helpful! I love IHG! Their rewards program is awesome! IHG is awesome! They are some of my favorite hotels! 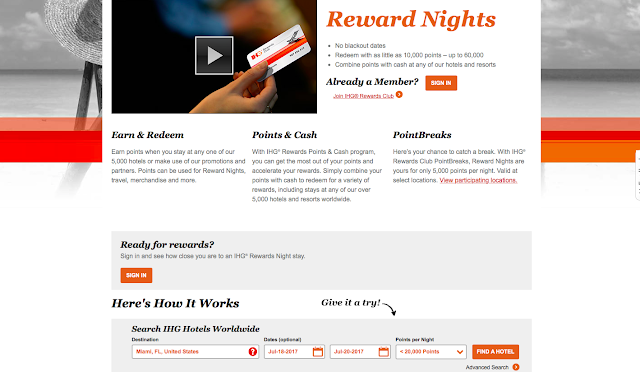 Hotel rewards programs are awesome, I haven't used IHG before but I need to try their rewards! They are so great and you can really stretch your points! This is so helpful! I'm always amazed by how y'all manage to travel so cheaply. The screenshots are helpful and make me feel like I could actually figure this all out! ;) I also love that you're going to travel with Baby K. He/she is lucky to have parents who will take him on such adventures! You can definitely figure it out, friend! If you need any help, just let me know! Traveling cheap is the only way to do it ha! We are so excited for new adventures with Baby K! Awesome! I definitely don't take enough advantage of rewards programs! thanks for sharing! We love it- just pay our bills and then travel for free! Thanks for reading! Rewards cards are the best! I have a CC like this that lets me book hotels and flights and it's been such a lifesaver. We love to travel and are always down to save a buck! You've shown me the light! Haha! I'm so glad to help! We love it- just pay our bills and then travel for free! Thanks for reading! Great travel tips! Will definitely have to use this program next time I study! Yes, definitely look into it! Thanks for reading! I'm not a member of this hotel rewards group but will definitely look into it! Who doesn't love being rewarded for travel! Yes, definitely look into it! I totally agree. Traveling for the win! Thanks for reading! Oooh, Alaska is totally on our list too! Ahh so helpful! Love getting things just to travel. Amen to that! Traveling has been SO much fun for us and we love doing it cheap. I am always looking for affordable ways to travel because I am a student with a small budget so I love this and am going to check it out. Perfect! I am so happy to help- let me know if you have questions! Ah that's awesome. My dad has IHG Rewards. I don’t have IHG rewards (we should probably get it), but we have been paying ALL of our bills with our AMEX cards so that we can get the sky miles for our Italy trip next summer. I do wish Costco was still taking AMEX! We flew to Ireland and then home from Rome for free and it was awesome!! Yay for travel cards! I'm not a a IHG rewards member, but may look into it! Sounds like an awesome program! Credit cards scare the HELL out of me, but they have some seriously great deals! Hoping to take a trip soon with my boyfriend. I know what you mean. We only put things on our card that we can pay off immediately, and then we get to travel free!